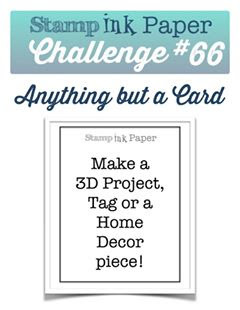 Tina's Crop Shop: SIP Challenge #66 - Anything But a Card! Hello and Happy Tuesday again! I hope your week is off to a great start! I had a craft fair last weekend and have two more coming up this Saturday and the next! Today's challenge at Stamp, Ink, Paper is a super fun one.. Anything But a Card!!! Have you ever made a mistake and it turned into something cool! Well that is exactly what I did on this project! I was scoring and cutting some 12x12" cardstock to make One Sheet Wonder Mini Albums and I made a cut someplace where I should have scored! Ugh! Not to worry.. 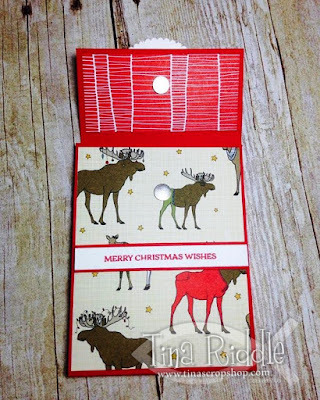 I decided to make a triple gift card or tag holder! So here you see the front of the gift card holder. Luckily I had some retired DSP with Mooses on it to go perfectly with the Moose Head from the Jolly Friends Stamp Set. 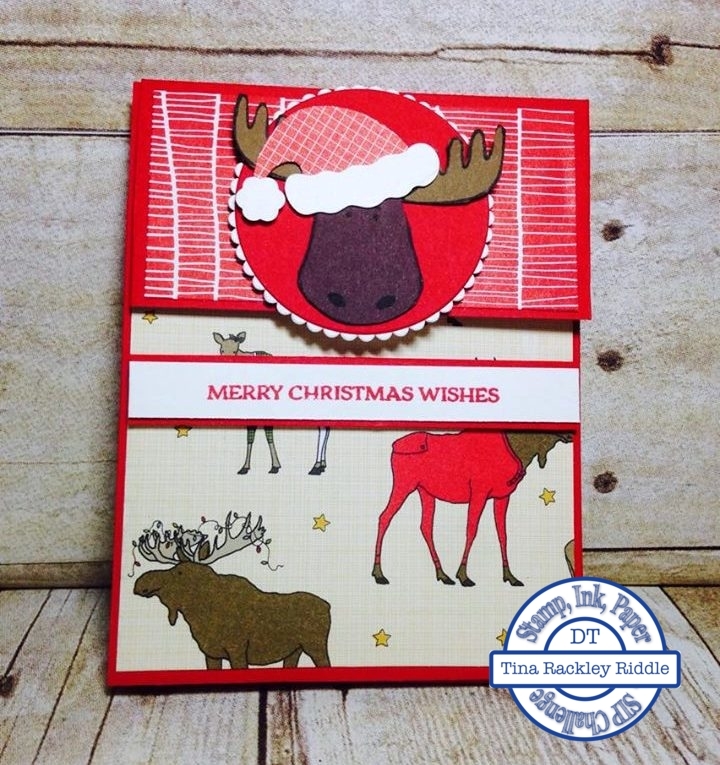 The sentiment on the front is front the Santa's Sleigh stamp set. For a closure, I used BasicGrey Small Magnetic Snaps. As the gift card holder unfolds, you see the inside sentiment, also from the Santa's Sleigh stamp set. 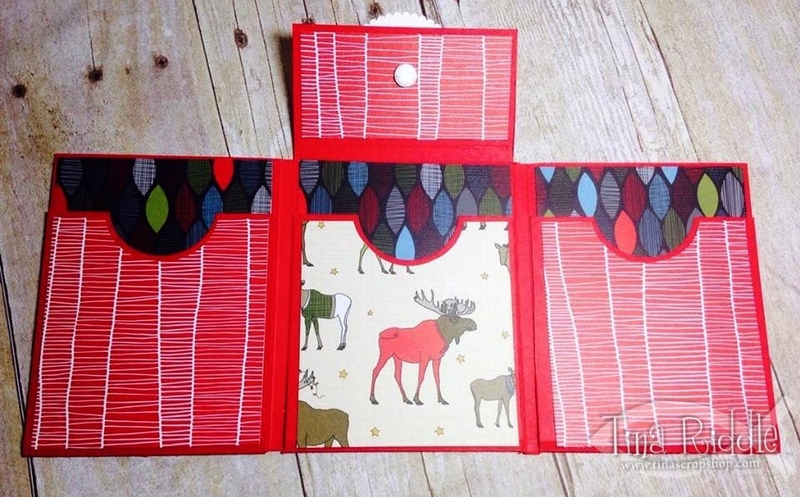 You will also see the first gift card pocket. 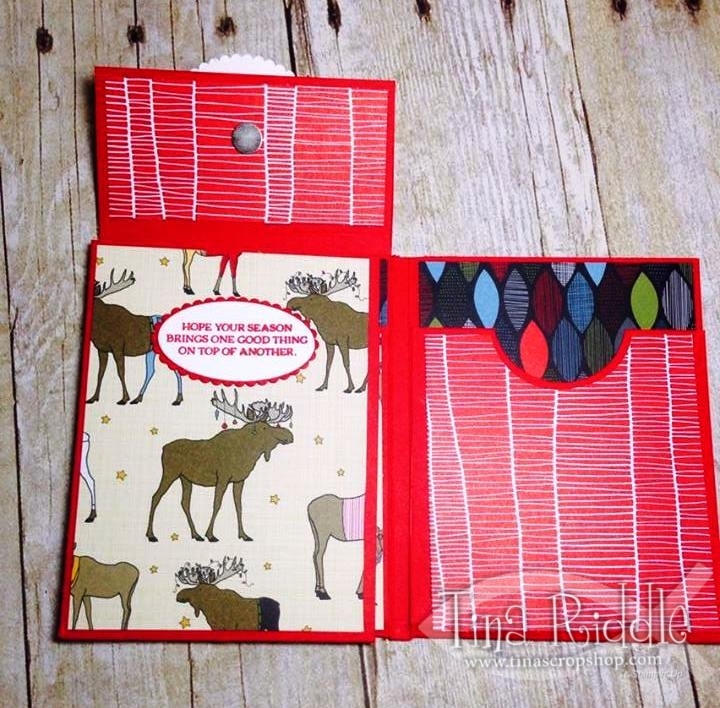 And as you completely unfold it, you will see all 3 gift card or tag pockets! Score a piece of 12x12 cardstock on one side at 2 3/8" and 7 1/4"
Rotate and score the next side at 3 7/8", 4 1/8", 8" and 8 1/4"
Use your bone folder on all of the score lines so that they will easily fold. When you look at the cardstock, you will see 3 short sides (for the flaps) and 6 rectangles that are approximately the same size. Cut off the 1st of 3rd small flap rectangles. 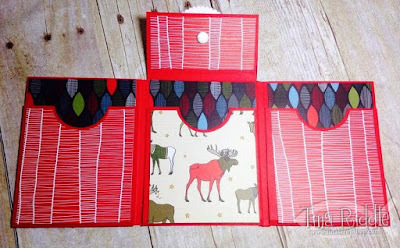 Cut off about 1 1/2" from the bottom rectangles and use a circle punch to punch a dip in each of those three rectangles. Use a strong glue or tear tape to adhere the sides of the bottom rectangles when you fold them up to create your pockets. I used tear tape and it worked very well! Decorate as little or much as you want to.